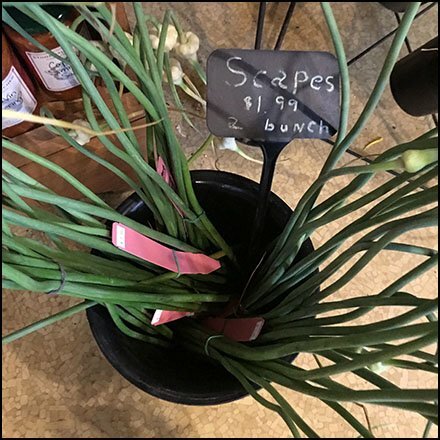 Scapes can be scallions, chives, garlic. I’m not sure which of these offered by Scapes For Sale Sign At The Farm Store. But the live display, bucket container, and hand-lettered Shapes sign are what intrigued FixturesCloseUp. Merchandising like this adds to the rural ambiance of the folksy county store. And you can see that the offerings are the freshest of fresh. This Scapes For Sale Sign At The Farm Store seen at The Lands at Hillside Farms, a non-profit, educational farmstead teaching sustainable life choices, Shavertown PA.